At no age does one get old; unless you want to feel old, then go ahead and admit that you are. In my struggle to keep my burgeoning youthful spirit, I enjoy still fantasizing about celebrity Johnny Depp. Even now, him going into his 50’s, I still get the craving to feast upon him like a nicely aged bottle of wine. It started back when I was in 8th grade; the ripe age of 14, I had discovered that girls could have crushes on guys that were not exactly around to see them google all over them. I would walk into my friend’s room and there would be posters of people like Eminem or Brad Pitt. That’s when I became fascinated on the idea to fixate my obsession with something beautiful, with the man we call Johnny Depp. I had watched, over and over, the movie Cry-baby and even knew that he had a small part in Nightmare on Elm Street. He played the cute boyfriend in both movies, so it seemed that is where my wild dreams of me and a man together would manifest. You ask women why they like older men. It probably comes from past infatuation with overly successful untouchables. As much as I do like the outer shell of my arcane paramour, there are some peculiar attributes that would be opposing. Smoking a thousand cigarettes a day can really put the definition in one’s dotage. Seriously though, what is with the revolt on quitting? But, he really has many phenomenal traits that make him a diamond in the rough. With being a diamond, means being multi-faceted. There are several examples of how Sir Depp is beyond dexterous, starting with this video of him and celebrity sensation Paul McCartney and others, playing some good ol’ jazz and blues. Just a glimpse into what amazing lengths this man has gone through to end up right where he is. Music will be a more favorite hobby of Johnny’s. He wields such talent for instruments and lyricism… The vibrating sounds and melodic poems he envisions shake his cumbersome soul and fuel creative juices. All Johnny’s career looked like, at the beginning, was being in a garage band, The Kids, and opening up for Talking Heads, but that wasn’t enough to make it in real life for him. He hit it hard to study acting; well, because he couldn’t even sell pens to a stranger let alone convince an audience of his stage presence. Who knew, with a little determination, what a remarkable occurrence would come about. He hit it big with the television show 21 Jump Street, leading him to his next big break working with director Tim Burton, of whom I am quite enamored with as well. I love Depp’s early work because it shows his raw self. Not saying he does it differently now, but he left himself in it the whole time. You could tell he was the bad boy from the wrong side of the tracks, but that is what kept you wanting more. Something you can’t have, but left a good taste in your mouth. Like a nice cuban cigar, freshly imported and highly sought after, yet illegal. I am sure that is the exact thing those agents were thinking, when he rolled in with his cuffed shirt and tore up jeans, ready to play the role of a draper in Cry-Baby. My heart flutters at the thought of seeing that lip snarl when he sings. I will sit through anything, at the chance to see his developed character that he has portrayed this time. The only musicals I even like are because they cast Johnny in them. Ha! Chilling and ominous his voice is, yet mellifluous at the same time. Embracing the strange and beautiful is something Johnny Depp will never take advantage of. He indulges in unique avocations and gets to portray quite a few in some of his roles. 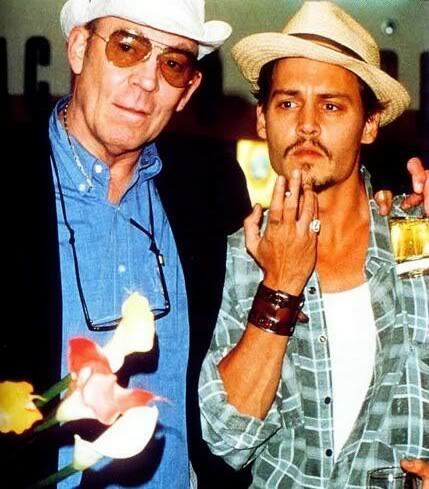 In my opinion, anyone who fancies work done by Hunter S.
Thompson, as Depp and I both do, probably has a bizarre take on life. I can see it in the way he envelops all his roles, you can tell he has an actual interest in that story. The company Depp keeps is quite the similar. Always going for the outsider or perverse. Even Johnny Boy’s new girl has been deemed odd, having been quoted to be ambiguous in relations, going steady with people of both gender. His love for counterculture sets back as early as 13, when he was shown a whole new world of music and literature that his older brother Danny gave interests in pre hand. Depp’s interests, including Van Morrison and his beloved “Koran”, and a roughed-up paperback book called On the Road, paved the way for his growing obsession with oddities. My obsession in High School was pirates and nautical art. You think kids these days have pirate obsessions, well I would give them a run for their money. I would eat sleep and breathe rum, slang-terms, and debauchery in my later youth. Depp himself would be proud, only I never thought of it then, but he could be the very person who availed me into such personal fondness of another collecting hobby. I had pirate flags, posters, shirts, books, and even a light box that hung on the wall with Jack Sparrow on the front illuminating my room. I got a Jolly Roger tattoo as my first tattoo, at 17 to symbolize my insubordination to lawfulness. Parley! That part of me will never die, as it will never die out in Mr. Cunning here. Believe it or not John Christopher Depp II, is pretty shy and likes to hide out more often than not. There is a quote people use often that he said, “I’m shy, paranoid, what ever word you want to use. I hate fame. I’ve done everything I can to avoid it.” This includes, at the beginning of his career in the 80’s, Johnny shaved his eyebrows to stay out of the limelight and give less attractive photo ops for teen crazed celebrity magazines. Nothing about Depp has ever gave anyone the thought that he might enjoy the stardom, he even is weirded out by the title given to him by People’s Magazine as “Most Sexiest Man Alive”. I believe it’s because he looks at what he does as a job and doesn’t have time for things like celebrity gossip. So he puts his nose to the ground and keeps on going. His style sense ranges from dapper 40’s man to hobo-chic, not to be confused with boho-chic, this is the style in which his parents dressed him as a young child for Halloween, ” the only difference between now and then is that then they drew more beard on me than I can actually grow.” He can rock any hat, my personal favorite is his fedora, or dress in his favorite trinkets he collects. Like an armband that he had made to resemble the one he wore in 1986 Platoon. Depp is kind-of a superstitious man and will bring with him charms of good luck. Who can’t relate to wanting some good karma on your side? I would say Johnny Depp has stacked his karma chips and can cash in anytime. He adores his fans just the same as they do him. It’s no wonder he is a timeless classic Hollywood heart-throb. He, not only gives credit where it is due, but still surprises us by kindly giving some of his precious time to fulfill some ultimate dreams of fans everywhere. You can get a glimpse of him in YouTube videos of the fans on the day they meet him, he has kind words to say and a warm smile on his face! Just can’t get any more surreal than that. Family first is Depp’s new motto. He is there for his children and will continue to show exemplary father figure, role model behaviors to set example for the not-so-young, any longer, teens. It began with the birth of his daughter; it was a rebirth of Johnny. He had just gone through a rough past several years with the death of his buddy River Phoenix outside his co-owned club, Viper Room, and the roller coaster relationship with Kate Moss which broke off just a year before the birth of his new angel. He teetered on the edge of a road of broken and shattered dreams and his rising fame and fortune. 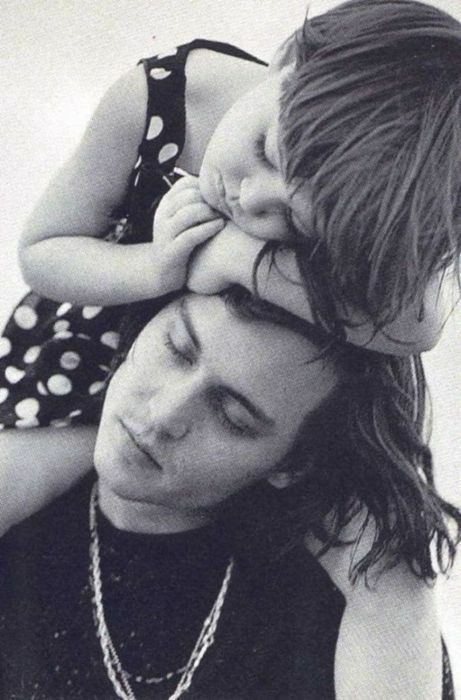 With the presence of his children Depp feels at home, ” …that fog just lifted” as he puts it in an interview in 1999 after Lily-Rose’s birth. He describes it as a fog because of all the commotion going on before hand and all the unsure things about life you constantly are reminded of just hang before your eyes, then after a little you is born it all just makes sense. He is humble beyond words! In any interview or any statement Johnny is always surprised at the impact he has made and is still making today. Don’t be so modest, it took a lot to get here and we all thank god you made it this far. His simple, yet resonating voice sticks with you as he speaks of down playing the lead acting role he is taking on, or how he never saw that low-budget film actually making it big. He doesn’t care if his movies make number one at the box office, he just does the roles he enjoys and gets a thrill out of living life to the fullest. His acting career is only one facet you see of him but underneath the glam attire is a being of great magnitude that will keep you begging for more. Everyone is entitled to their fandom! No matter how young or old, there needs to be inspiration to life. with out it we are just walking zombies of the mundane. Provide your soul with something edgy and unknown and shake up the world you live in.